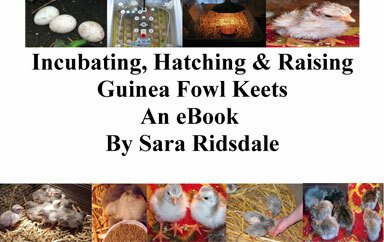 Today I sent 6 guinea fowl eggs to my new blogging friends at The Cottage Smallholder website. After reading an article about The Cottage Smallholder’s chicken, Mrs Boss, getting broody, I left a comment on their site offering some of my guinea fowl eggs. 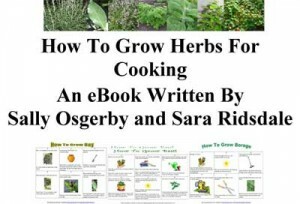 I was delighted when I received an email saying that they would really like to have a go at raising guinea fowl and would welcome any eggs I had. So after a couple of days hunting out the guinea fowl nests and trying to beat the magpies to the eggs, I managed to collect 6 eggs ready to send in the post. This morning I wrapped each egg individually in a plastic bag and then placed another plastic bag under each egg in the carton. Then I padded out the top of the egg box with more plastic bags. When this was done, I went on the hunt for a cardboard box but I couldn’t find one in the house, so I drove to the next village to the post office to buy a parcel box. They didn’t have any but the kind post master gave me an empty chocolate eclairs box which wasn’t too big, although he didn’t have any brown parcel wrap. I knew I had some at home and just hoped that it would be large enough to cover the box. With creative wrapping I managed to get the box covered and ready for posting. Once again I headed back out to the village post office. However when I arrived for the second time that day the post office part of the shop was shut. This meant a trip to the local market town. I am pleased to say that the parcel is now safely in the post but whether the eggs will arrive at their destination tomorrow in one piece will be a different matter. I wait with baited breath to see if The Cottage Smallholder gets their parcel safely and then waiting to see if Mrs Boss will accept the eggs and whether the eggs are indeed fertile is a whole other story! Hope that is of some use to you. Let me know how you get on. 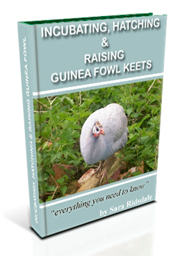 do you sell young guinea fowl, i’m in northampton and would love a couple of young guineas again – our ones died of old age, but i’m struggling to find anywhere here that has them.